Silverbeet or swiss chard is very famous in western countries, i never knew about this kind vegetable until i live here in Australia. The word Swiss was used to distinguish chard from French spinach varieties by nineteenth century seed catalog publishers. The chard is very popular among Mediterranean cooks. The first varieties have been traced back to Sicily. Some of Indonesian friend here told me that the silver beet taste like cassava leave that used to eat in Indonesia, so i tried to cook them as a stir- fry, well the taste is not really the same, but not too bad though, i will try again ext time with different style of cooking. All you need for this dish are sliced small brown onion, red chili and garlic then saute them with a little water, add a bit of water then stir in ready wash and cuts silver beet, season with salt and pepper. 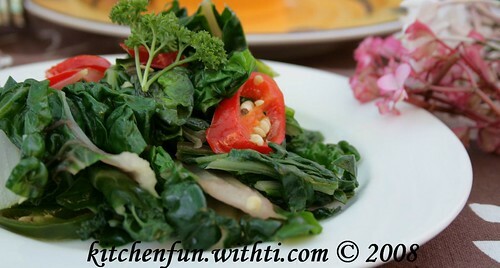 swiss chard emang enak. gw seringnya bikin tortilla patata (potatoes tortilla) atau di oseng² juga. Mindy: Aku juga suka bikin gulai nangka pake silverbeet ini lho Jeng, yummy!